Avaal Technology Solutions Inc celebrated the upcoming holiday season with an elegant function at Chandni Banquet Hall in Brampton, Ontario. 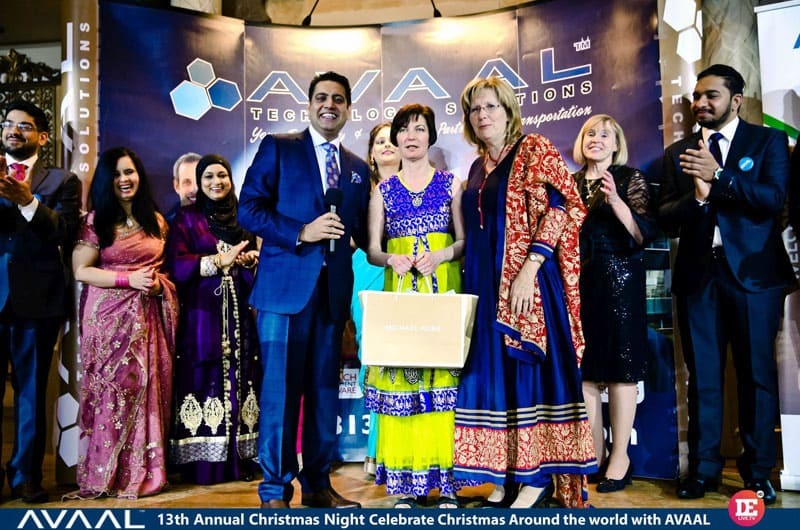 The event, Avaal's 13th Annual Christmas Night, was held on December 12, 2015 and attended by over 700 people. The theme of the night was Christmas Around the World. Avaal Technology Solutions was pleased to lend its support to SickKids Foundation by donating $5,000.00. With the support of all its customers, family and staff, an additional $2,500.00 was raised for the SickKids Foundation. The SickKids Foundation was established in 1972 and raises funds to support the Hospital for Sick Children and also invests in child health research, learning and care. The Hospital for Sick Children is affiliated with the University of Toronto and is Canada's most research-intensive hospital. Santa Claus was able to take a couple of hours from his busy holiday schedule to visit and meet the children. Santa brought gifts for the children and posed for photographs. Santa reported that all the children have been very good this year and should expect a great Christmas. The evening began with Avaal's Master of Ceremonies for the night, Dr. Ranvir Sharda, who welcomed everyone to Avaal's 13th Annual Christmas Night. Dr. Sharda is well known in the community and kept the guests entertained with his witty banter. Guests also enjoyed speeches by many important dignitaries. The Chief Guests for the evening were Linda Jeffrey, the Mayor of Brampton; Harinder K. Malhi, MPP for Brampton, Springdale; Sonia Sidhu, MP for Brampton South and Gurbax Malhi. Avaal CEO Dara Nagra gave a welcome speech, thanking all the guests for taking the time to join him and his staff in celebrating the holiday season and told the audience of Avaal's accomplishments over the past year. Avaal's India office moved to a brand new location at Welldone Tech Park in Gurgaon. Other milestones included finishing the 113th Dispatch Course at their Vaughan campus; completing the 52nd Dispatch Course at their Vancouver campus; and the 27th Dispatch Course at their Winnipeg campus. Mr. Nagra also thanked his parents, his wife, his children, his sisters and his brothers in law for their support over the years. Lastly, he invited his staff to join him on stage. Interspersed between the speeches were live entertainers which represented countries around the world. The entertainment included a Native Hoop Dance, Flamenco Dance, African Dance, Belly Dance, Martial Arts Performance, Jamaican Dancehall Performance, Indian Dance and Brazilian Samba Dances. Once the speeches and entertainment were complete, the guests were served a delicious Indian Buffet catered by the chefs and staff at Chandni Banquet Hall. Dara Nagra and everyone at Avaal Technology Solutions would like to thank everyone who was able to attend the function and everyone involved in making the event a huge success. Avaal Technology Solutions wishes everyone a Merry Christmas and a Safe, Happy and Prosperous New Year.